home Fashion Khloe Kardashian Vs. Jordyn Woods: Long Peroxide Blonde Hair & A Skin-Tight Dress - Who Wore It Better? Jordyn Woods rocks a peroxide Blonde Hair and a skin-tight dress, a similar old look to Khloe Kardashian. 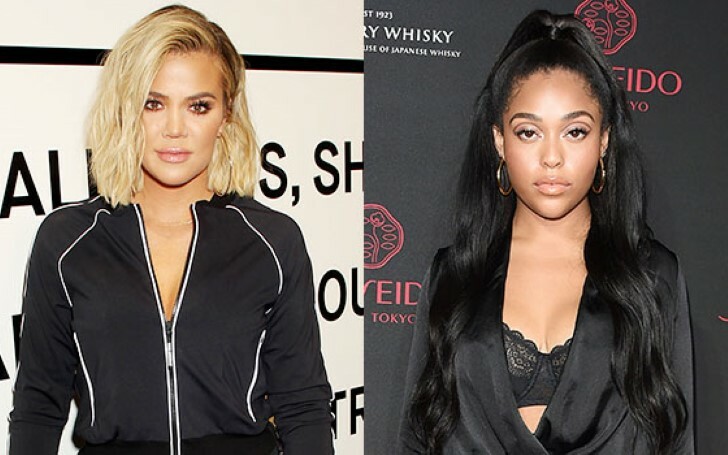 Social media influencer, Jordyn Woods flew to London to launch her Eylure x JordynWoods eyelashes, leaving all the controversial drama involving Khloe Kardashian and Tristan Thompson behind. Soon after landing to the beautiful capital of England, the 21 years made sure to turn heads looking all unrecognizable whilst she was out and about with different brand new surprising looks. Woods was spotted looking all gorgeous in a blonde hair wig as she stepped outside of her hotel room. After spending her entire afternoon at the stores to celebrate her eyelash launch in a fancy creamy coat she accompanied with a pair of faded blue jeans and high shining golden heels, the star opted for an outfit change to attend an evening party. Jordyn Woods out and about in London. The young entrepreneur looked stunning in a bright peach skin-tight knee-length dress that featured a long zip on the V-neck styled front and the top part of the dress that flaunted her beautiful curves. Woods paired up her curves hugging dress with a stylish silver jacket to wrap up from the chilly English weather. Jordyn didn't accessorize her radiant party looks much except for wearing a black shiny wristwatch on her hand. All glammed up with a light touch of a makeup palette that consisted of matching lipgloss and mesmerizing eye makeover, the part-time model completed her look with a pair of sparkly matching heels that features numerous straps wrapping around her feet. In addition, the star had the same blonde wig curled in loose waves she wore earlier in the day during her launch party. Wood also carried the same Louis Vuitton bag to doll up her look. As we studied up her hypnotizing look from top to bottom, it reminisced of the time when Khloe looked quite similar a few years back to Jordyn latest look. As a matter of fact, three years ago, the 34 years old reality star too rocked a similar skin-tight dress with a similar blonde wig then. Khloe Kardashian & North West on their way to attend Mary Jo Campbell 82nd birthday. Sported in the similar dress; a dark peach suede tight dress, back in 2016, to attend the 82nd birthday party of her grandmother, Mary Jo “MJ” Campbell, the 'Keeping Up with the Kardashians' star looked super beautiful. At the time, the mother on one, True Thompson also rocked a similar blonde wig curled up in loose waves. Similarly, Kardashian stepped into a pointed matching heel. Well, it's no question here that both the star who ain't speaking to each other at the moment due to the repulsive cheating scandal looked amazing though. In fact, we personally think, to be able to witness the two who are naturally brunette in different hair color and the fact that they always manage to flatter their curves no matter what they wear is very impressive and complementing. Innit.